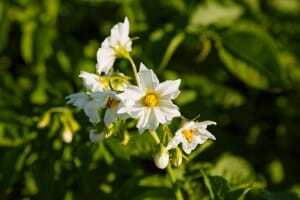 Belonging to the Solanaceae family, its scientific name is Solanum tuberosum. They are thin, long, fibrous, and very branched out. They are not capable of penetrating harder soil very easily and often only achieve full development in softer, less compact soils. They are aerial, thick, strong and angular. At first they stand up straight, but with time grow down towards the soil. The stems originate in the skin of the tuber, varying between 0.5 and 1 meter in height. They are greenish brown due to pigments related to chlorophyll present in the whole stem. They are the edible parts of the potato plant. 5 to 10 tubers are usually produced per plant. Our bitter variety is characterized by its high content of dry matter, its yellow colour, and delightful flavour. Nowadays it is one of the varieties most suitable for frying, allowing us to make our famous potatoes chips. They are composed of primary, secondary and interlayer leaflets. The nervous system of the leaves is reticulated in a grid-pattern, with most nerves situated in the middle of the leaf and its edges. Surface Ploughing. The purpose of this task, which is done at about 20-30 cm of depth, is to pull up remnants of past crops. It also facilitates water introduction into the soil and, should it be necessary, fertilizers are also added at this stage. Mouldboard Plow. 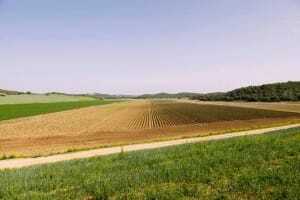 It leaves ridges in the land, which allows for better aeration and water circulation. It is also the most appropriate for hard, heavy soils, excessively wet soils, or soils that will not be ploughed for unknown amount of time. It does has disadvantages, though: one of them being that it could possible over work the land and another being the need for a large work area and the plough’s ability to move in between crops. Tillage/Hoeing. This task, which is done at approximately 15 cm surface depth, is carried out one to four weeks before cultivation in order to break up lumps and better prepare the soil. It is advisable to do this task in two steps: first doing an initial once over a week or two ahead of time, then once more a few days before planting. Nitrogen, phosphorous, potassium, magnesium, and calcium are elements that play a large role in the nutrition and growth of a potato. Other important elements, although needed in smaller quantities, are: sulfur, zinc, and to an even lesser extent, boron. Nitrogen. 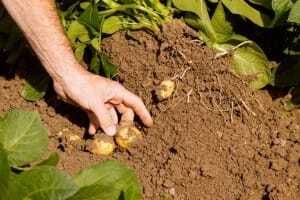 It is the determining factor in crop yield due to the fact that it favours foliage development and tuber growth; however, if applied in excess or during early stages of tuber development, it delays said development and results in smaller crop yields. Phosphorus. It benefits root development, speeds up tuber formation, as well as increases the number and quality of tubers which form. Potassium. It determines potato quality. It favours starch formation and provides plants with a greater resistance to frost, drought, and to cryptogrammic illnesses (especially mildew). It also favours tuber width (it increases the number of thick calibre tubers) and ensures tuber survival. Potassium detection is estimated at approximately 9 kg of K2O per ton of tubers. Magnesium and Calcium. The potato plant does not tolerate deficiencies when it comes to these elements. Particular attention must be paid to soils with magnesium extremes, that is, soils either lacking or very high in magnesium. Special attention should also be paid to calcium levels in soils where pH levels are very acidic. Detection levels should be around 1 Kg of MgO and 4 Kg of CaO per ton of harvested tuber. Organic Fertilization. 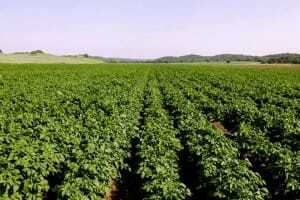 The potato is a crop that improves the physical conditions of soil and the development of other tubers. The potato reproduces clonally from whole tubers. 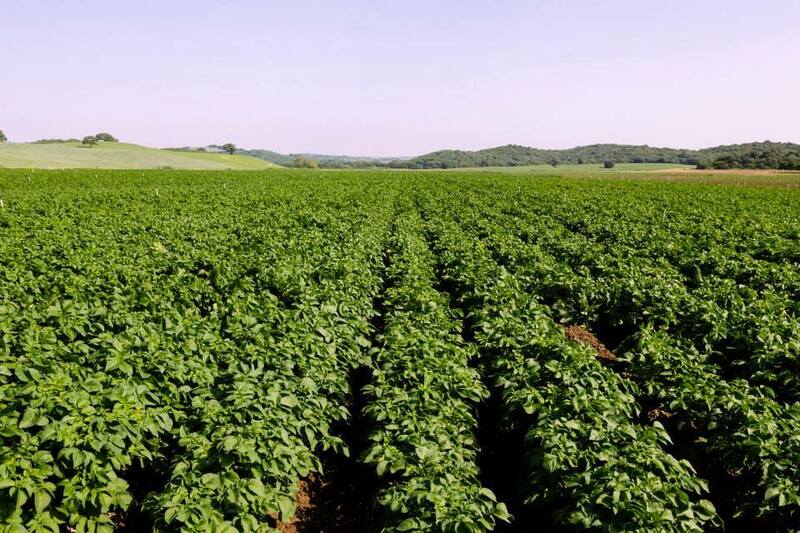 The number of tubers harvested (and consequently, the number of kilos), does not only depend on the number of plants in the field, but also on the number of stems each one has. It is advisable to disinfect the seed through the application of a fungicidal product (like Flutalonil 50%, Mancozeb 43% or Metiltiofanato 45%) to prevent rotting caused by fungi in the soil. 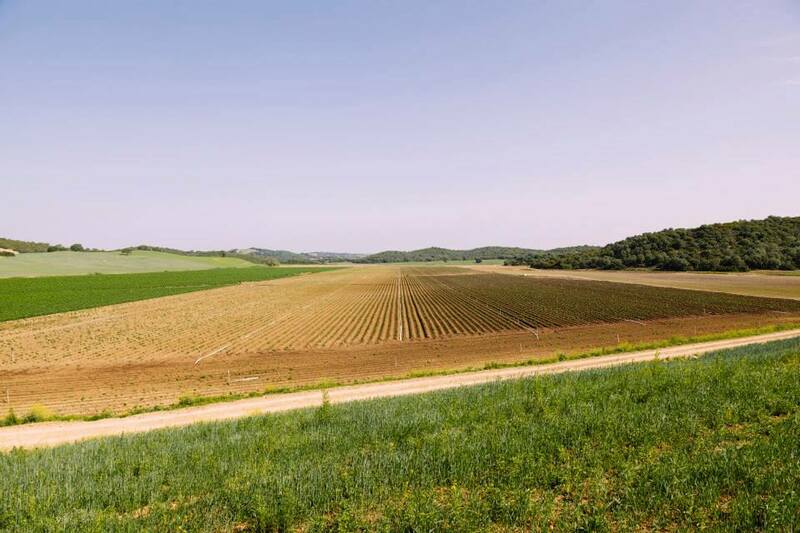 Based on the variety’s natural growth cycle, and most importantly, the production region, the time for planting in Andalusia can range from mid-December up until the end of January, resulting in harvests around mid-May to late June. 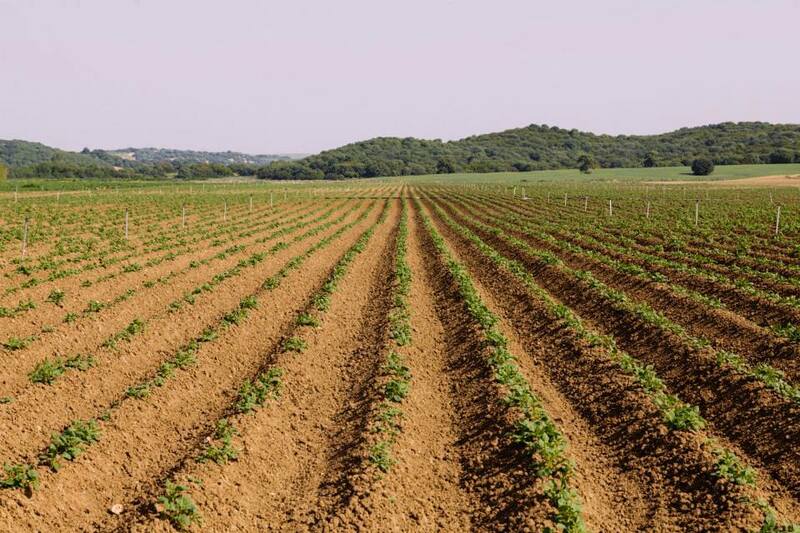 The layout for planting is defined by the separation between planting furrows themselves and the distance between the tubers inside each furrow (45.000 plants per hectare). 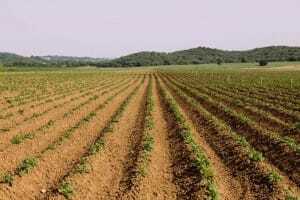 The potato crop normally requires a constant source of water. The most used irrigation methods are normal sprinklers or drip sprinklers. Harvest: Harvesting is one of the most delicate tasks when it comes to the potato crop. It is carried out when the tubers are sufficiently mature and the skin completely formed. The potato variety we use in particular has to achieve levels of dry matter greater than 18% in order to be suitable for frying. Measuring: The minimum size of potatoes that we set is 45 mm and the maximum is between 90 to 100 mm. By doing this, we aim to obtain larger chips for the final product. Storage and preservation: Once sized up, the potatoes are stored in large wooden boxes, which allow for proper ventilation and ensure they last longer. Humidity is kept around 80 – 85 %.